Consider Ms. Reagan’s difficulties in light of fact that her husband’s case was probably a “best case scenario” where Alzheimer’s is concerned. As a successful actor and former governor and president, Reagan presumably had better-than-average financial resources and retiree benefits. Nancy was likely assisted by round-clock home health care in tending to her husband. He in turn benefited from a supportive family and a loving partner in Nancy who seldom left his side. He also knew from at least 1994 on that he had Alzheimer’s, which gave him some time to make plans for his fading sunset years. Many (if not most) people facing Alzjeimer’s come up short in at least one of these areas. Whether you are an attorney or a family member, there is no simple roadmap for dealing with all the issues related to Alzheimer’s (and other dementia-related afflictions). Your situation might call for multiple legal resources and tools. For lawyers, consider starting with Alzheimer’s and the Law: Counseling Clients with Dementia and Their Families by K. Peck and R. Law. 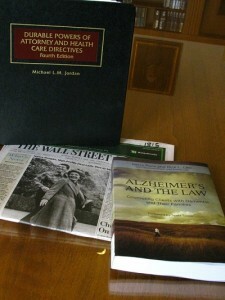 There are also multiple resources on the ABA Commission on Law and Aging page. We also have numerous treaties and tools in the library addressing elder care issues. For laypeople, consider contacting the Minnesota-North Dakota chapter of the Alzheimer’s Association to learn what local services are available. Be aware that your situation may call for legal tools including Power of Attorney, Guardianships/Conservatorships, living trusts, and arrangements that encompass assisted living. Most of all, give yourself the benefit of discussing your situation with an attorney. You can find legal help through resources including Volunteers of America or the Ramsey County Bar Association.